NASA planners are finalizing the configuration for the next generation cargo heavy lift launch vehicles with announcement of its basic configuration due during the week of 15 August. An integral part of these studies includes upper stages and other hardware needed to move payloads once they are in space. As is the case in concepts being developed for crew transport - using the Crew Exploration Vehicle (CEV) (see "NASA's New CEV Launcher to Maximize Use of Space Shuttle Components") , the ideas NASA has been considering for more than a year reach back to Apollo era concepts, and use derived versions of existing space shuttle hardware - all mixed with 21st century mission requirements and technology. One of the upper stage options under consideration includes a familiar concept from early in the space station program. 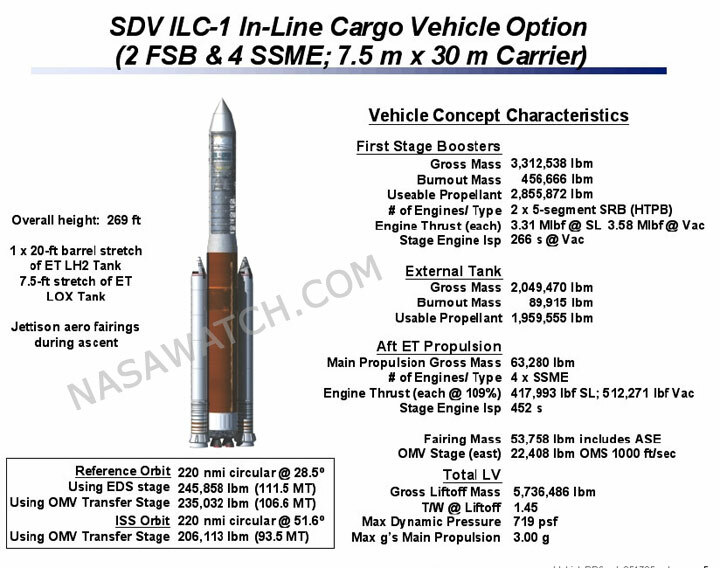 According to study documents obtained by the authors, several configurations of shuttle-derived vehicles (SDV) include flight use of an Orbital Maneuvering Vehicle (OMV). OMVs are known by a more generic, common name: "space tugs". The space tug concept goes back decades and was part of the original Space Station Freedom (SSF) program, which issued a contract to TRW to develop the reusable spacecraft. The original plan was to use the OMV to retrieve payloads and satellites such as the Hubble Space Telescope and bring them to SSF for repair work. The OMV was also to service a series of two free flying space platforms that were to accompany the manned station base. Eventually, as part of the inexorable progression of belt tightening and configuration shrinking which the space station has undergone, the free flyer in equatorial orbit was cancelled. The polar orbiting free flyer was broken into smaller subunits and eventually evolved into the satellites NASA has used to implement its original "Mission to Planet Earth". The OMV was also cancelled before development could begin. But the utility of such a vehicle - powered by conventional chemical propulsion or other means - was always on the wish list of many a space architect. Now, with NASA choosing an SDV heavy lift booster to assemble lunar exploration fleets in low earth orbit, and the possible use of a SDV to complete assembly of the International Space Station, the concept of an OMV has been revisited with some enthusiasm. The origins of new launch vehicle choices for crews and cargo actually predate the Bush space plan. In the fall of 2002, then NASA administrator Sean O'Keefe won White House support for a new manned spacecraft. Called the Orbital Space Plane (OSP), the spacecraft was to service the International Space Station as a ferry vehicle, supplementing - but not replacing - flights of the larger and more complex shuttles. At the time, NASA was planning continued shuttle flights until 2020. The OSP was to come online within four years of the final contractor down select, then planned for 2005. While the contractor teams bidding for the OSP included both capsule and lifting body configurations, a capsule was NASA's preferred architecture, according to sources who participated in the OSP planning. Following the Columbia accident in February 2003, planning for the OSP was placed on hold. Eventually, the OSP would be superseded-or morphed into-the requirements for what eventually became the CEV. Many involved in the process now look back and see that the OSP had ended up serving as a stalking horse for the more expansive - and evolutionary - capabilities of the CEV proposed as part of Bush's Vision for Space Exploration (VSE). The CEV, and the unmanned cargo launchers that would also be envisioned in early 2004, would reflect a major shift in U.S. space transportation planning. Reversing the space shuttle's 'space truck' role decided upon in the early 1970s, the approach as developed by NASA would separate crew from cargo on the next generation space lifter. In fact, the launch systems being defined would require several different launch vehicles, with varying lifting abilities. While NASA would still rely on large traditional aerospace firms for hardware and services, NASA also began to reach out to less traditional participants. The so-called "entrepreneurial space" providers, who were often long on ideas but short on cash, would now play an enhanced role in the Bush space vision. They well may have played that role in the OSP program had the project continued forward beyond 2003. Indications as to how these non-traditional players would participate began to emerge in a series of broadly framed activities and studies sponsored by the Exploration Systems Mission Directorate (ESMD) headed by Adm. Craig Steidle in 2004. Steidle's organization openly embraced and solicited the submission of new ideas and new teaming relationships. He also pushed the use of prizes as a way to spur innovation. Had not Congress withheld approval, the prize mechanisms utilized by NASA might have been more expansive than they have been to date. NASA was eager to use this new tool. Coincident with Steidle's forced departure from ESMD within week's of Griffin's arrival at NASA came even more details, as enunciated by Mike Griffin, as to how he saw entrepreneurial space" providers fitting into his newly accelerated version of VSE. Regardless of how the pieces came together, NASA had to get to where it wanted to go from where it currently operated. Money was limited, and there were only so many things NASA was doing that could be cut in order to free up funds. As Griffin was fond of saying, NASA already had a heavy lift launch vehicle - all he had to do was remove the shuttle orbiter from the equation. Many would find this decision to be troubling or at least annoying since there were many who were certain that there had to be ways to do the job better than relying on 30 year of shuttle thinking. Undeterred, Griffin would take the pragmatic route going with what he knew he could make work - even if it was not the most advanced rocket he could imagine. Yet he did leave the door open to hedge his bets for new ways of launching payloads - such as cargo to the ISS. Implicit in the ESMD's planning was an Earth orbital rendezvous strategy for the lunar fleet. From the earliest plans, a direct ascent or launch of all of the spacecraft and cargos for each manned landing aboard a single launcher, such as Apollo accomplished using the Saturn V, was deemed impossible from a budgetary perspective. The CEV was not designated as a lunar landing vehicle. If anything, it was to be analogous to the Apollo Command Service Module which could ferry humans to a space station (Skylab), and also serve as part of a lunar exploration complex. This meant that the CEV must achieve rendezvous and docking with a separate (therefore new) landing craft. 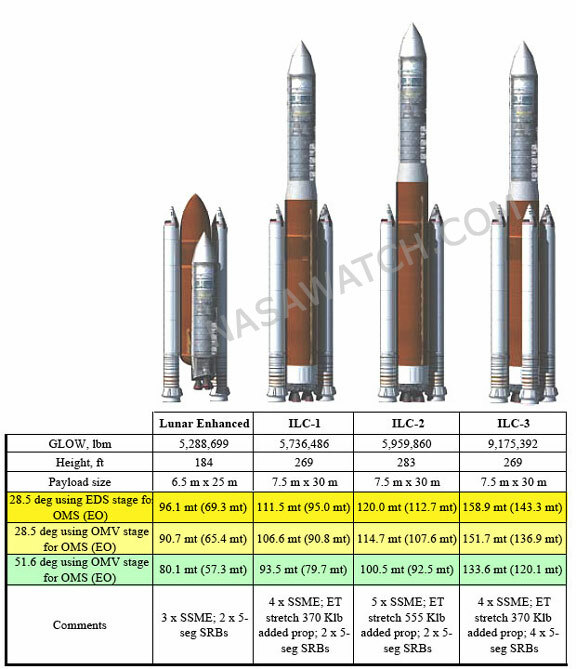 Given the throw-weight capabilities of the largest existing expendable launch vehicles, the Delta IV heavy and the Atlas V 500 series, either multiple launches of cargoes would be needed, or growth variants of these Evolved Expendable Launch Vehicles (EELV) would be required. These vehicles were by no means inexpensive - nor would the cost of modifying them and their launch support infrastructure be cheap. The architecture that received the most, initial favor from the time the ESMD was established in late January 2004 right after President Bush's VSE speech was the earth orbit rendezvous mode. The architecture designated three spacecraft elements for each manned lunar landing mission. Along with a CEV that carried the flight crew and their support equipment and propulsion system package, a Lunar Surface Access Module (LSAM) which was designed to undock from the CEV and take the entire crew to land upon the moon's surface. Upon completion of the mission, part of the LSAM would launch off the surface and rendezvous and dock with the CEV, orbiting unmanned following departure of the flight crew to the surface. The CEV and LSAM would use a similar approach to the Apollo CSM/Lunar Module/S-IVB complex to get to and from the moon. Launched separately, the CEV and LSAM would dock in Earth orbit. They would then dock with a third vehicle, the Earth Departure Stage (EDS) - also launched separately. The EDS would ignite to send the trio of docked vehicles to a translunar trajectory. The EDS would fire its propulsion system in a braking maneuver to insert the trio into lunar orbit. The EDS would undock and fire to leave lunar orbit, possibly for storage in a high L-1 staging base, or to reenter Earth's atmosphere in a destructive maneuver. Whatever the ultimate fate of the EDS, all three spacecraft could not be launched into parking orbit above Earth together aboard a single launch vehicle. While the CEV would most likely not exceed 30 to 40 metric tons in gross weight, the LSAM would bring substantial cargoes itself to the surface. 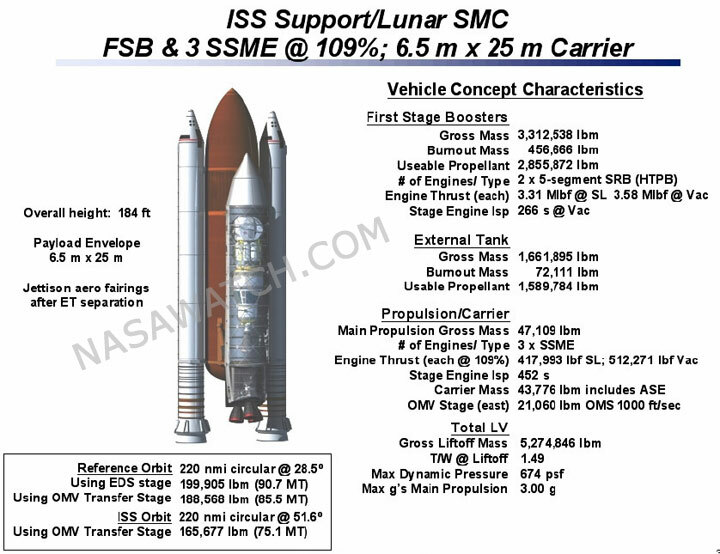 As of the spring of 2005, ESMD planners were considering two versions of the LSAM: one in manned lunar flight to carry a four-person crew to the lunar surface. A second version would be capable of launching and flying to the moon alone (unmanned) and landing large cargoes on the surface. Some follow-on extended stays on the moon envisioned by the Apollo program in the 1960s also considered such an approach. Studies were looking at an LSAM capable of landing as much as 28,000 pounds on the moon. 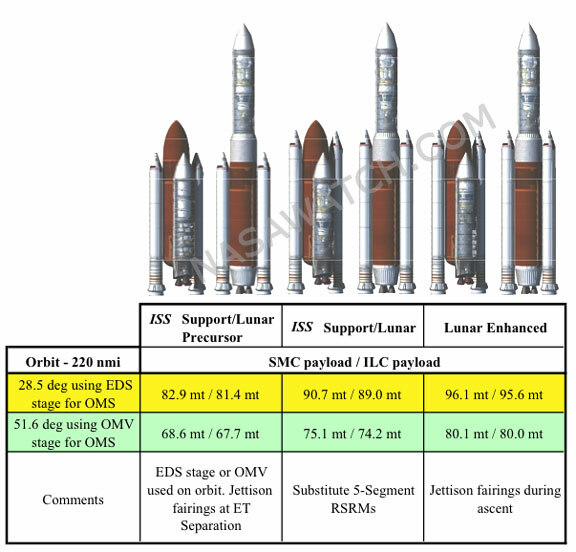 As a result of these gross mission requirements, designated early in the ESMD's planning, a large launch vehicle would be needed just to launch the lander. A second launch vehicle would need to deposit a fully fueled EDS into Earth orbit. A third, smaller booster would ferry the astronaut crew within a CEV. Out of these aggregate mission requirements emerged the need for a heavy lift launch vehicle that greatly exceeded the existing capabilities of the U.S. EELV fleet. As time passed and detailed trade studies continued, the concept of constructing a permanent facility on the moon would possibly entail not just the CEV and the piloted LSAM for landing and launching the crew, but additional robotic and cargo-carrying LSAMs to provide construction materials and pre-fabricated housing for the base camps. Since each CEV and LSAM required an EDS of their own, each cargo LSAM landing in advance of the astronaut crew would need an EDS of its own. Planners were studying a minimum of four and a maximum of six manned landings per year, with each landing requiring a CEV/booster launch and a heavy lift/LSAM launch. Additional cargo emplacements would require a dedicated heavy lift and EDS for each such cargo flight. If NASA desired to have robots working the selected landing site or base camp prior to the arrival of the human crew, then they too would require a launch vehicle and upper stage to bring them to the surface as well. Using EELVs for such a scenario, even if bought in large quantities, would be a costly option. 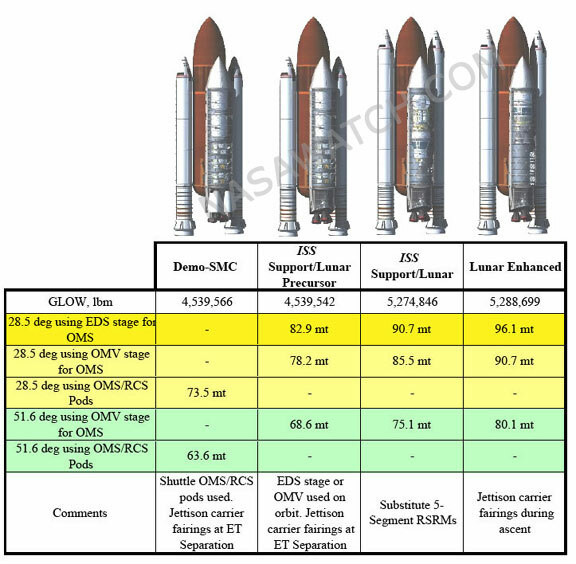 Thus the exploration architecture that was favored in the early ESMD days would require anywhere from eight to 12 annual launches of a new family of lunar-capable space boosters, with additional launches more than likely. The flight traffic model, while containing fewer launches than the most robust space shuttle manifest of years past (nine manned shuttle flights in the program's two most active years), the launch infrastructure for lunar flights would entail differently configured and several different booster and upper stages. It would require maintenance of the most complex launch system architecture since NASA operated Delta, Atlas, Saturn IB and Saturn V flight vehicles simultaneously in the 1960s and 1970s. The ESMD began a series of two 'Analysis of Alternatives" beginning in mid-2004 and extending into the spring of 2005. 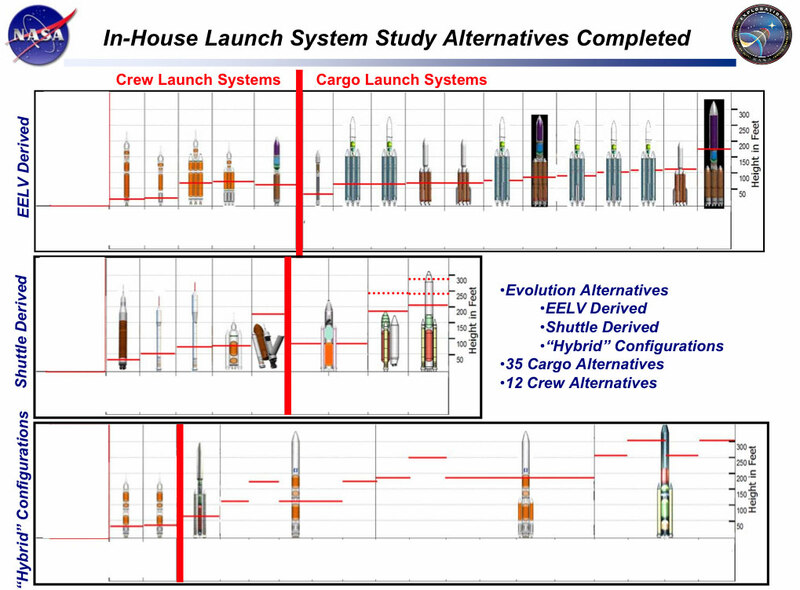 According to study documents obtained by the authors, these reviews covered 35 cargo launch system configurations in a trade analysis termed "integrated launch systems study". 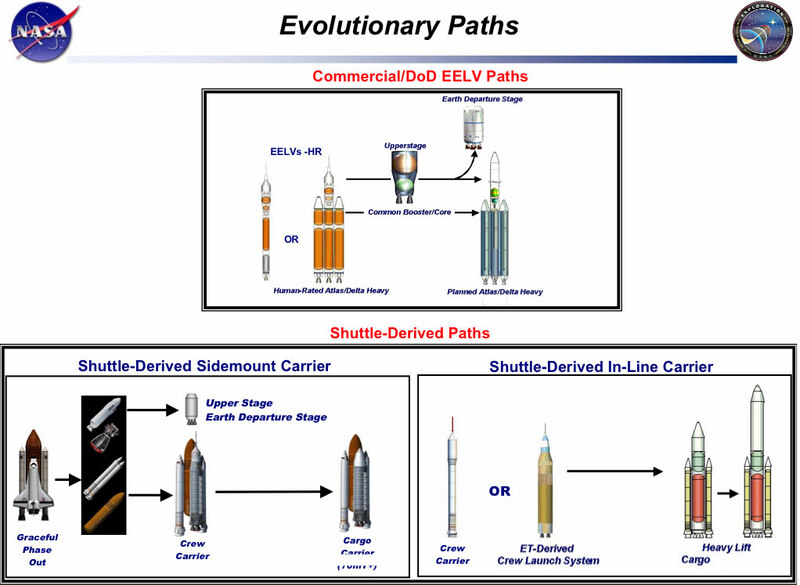 Two separate sets of boosters were studied; those derived from the EELV fleet of Delta IV and Atlas V vehicles, and those configured from shuttle derived elements. A separate study conducted at JSC looked at a heavy lifter derived from Ariane 5 and the Russian Energia, although these were believed to have been looked at mainly for comparison. Growth versions of the Delta and Atlas families were reviewed, with positive results. Planners found in their trade analyses that scaled up variants of both families could lift in excess of 40 metric tons, to as much as 80 metric tons. The latter figure was believed to be the smallest payload envelope a heavy lift design would need to carry in order to participate in a lunar mission. The increased lift was achievable by adding engines to the booster stages or core segments, adding core sections, or adding strap-on solid boosters. 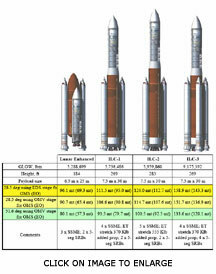 The rockets could beef up both launcher families' upper stages, replacing the variations of RL-10 engines now used on both Delta IV and Atlas V vehicles with other advanced Pratt and Whitney designs, or possibly J2S and SSME candidates, as had been studied separately for the crew launchers. As interesting as the technical options for EELVs were, negatives associated with the cost of implementing these technical options were considerable. Human rating an EELV would result in additional costs. Any EELV that would be enlarged for heavy lift cargoes would require entirely new launching pads and associated facilities in Florida. The guiding philosophy then shaping early ESMD launcher studies was a preference for a family approach - a derivative series that would be used both for manned flights of the CEV and a larger, but related variant for the cargo heavy lifter. This would be an echo of sorts back to the Saturn 1B/Saturn V mode of thinking used during he Apollo and Skylab programs. Human rating EELVs was possible but would be expensive, since in their current commercial use such a capability was not present in the design. Trade studies revealed that human rating both Atlas and Delta was in fact possible, however. But the heavy lift versions would need entirely new engine and vehicle pedigrees and launching facilities. With the appointment of Mike Griffin as NASA administrator, the preference for a shuttle-derived design grew. Griffin, a long-standing critic of the manned space shuttle program, was also a supporter of an unmanned version of the aging design. In fact, Griffin had urged the development of a shuttle-derived heavy lift cargo rocket more than a decade ago. That concept, while never flown, formed the basis of where ESMD planners began their studies of an SDV. As was the case in their preference for a manned space capsule for the CEV, so too in their heavy lift studies planners went, in a sense, 'back to the future'. Ironically, a shuttle-derived cargo launcher had been seriously studied before by NASA and industry. The first serious review of an unmanned cargo launch vehicle derived from shuttle flight hardware was conducted in 1977 and 1978, before the actual manned orbiter flew. NASA conducted a series of studies of very large expendable launchers that would be employed in assembling big structures in low orbit. One reference configuration postulated a shuttle family including the manned winged orbiter and a series of large cargo vehicles that could assembly and maintain a huge solar array complex in orbit. Elements of the solar power system would be brought up on the heavy lift vehicles and assembled by spacewalking astronauts from the orbiter's cargo bay. Remember, this was 1977. These designs were imagined at a time when shuttle were still seen as flying like a commercial airline fleet- and manifests showing hundred of flights in the 80's and 90's - replete with ever growing fleets were presented internally and externally at NASA and aerospace contractors. And these fleets of shuttles would be building huge structures which were easy for corporate artists to envision but hard to rationalize once the true nature of shuttle operations became apparent. A decade later, following the Challenger accident, NASA looked again at a shuttle cargo booster. Late in 1987, NASA's Marshall Spaceflight Center in Huntsville issued trade study contracts for a large partially reusable shuttle cargo vehicle. Three contractors won initial study awards from MSFC; Martin Marietta, the builder of the space shuttle external fuel tank; United Technologies, builder of Titan strap-on solid motors; and Rockwell International, builder of the winged orbiters - as well as the shuttle's main engines. The trio won follow-on Phase B studies as well. All three contractors looked at in-line stacked vehicle configurations. But each company, independently of the other, concluded that such a configuration would require extensive changes to the existing shuttle's fuel tank, as well as entirely new launch facilities in Florida. These added costs eliminated the in-line vehicle. What emerged instead was a side-mounted shuttle configuration that replaced the orbiter with what was called a "Cargo Element". Flanked by the existing shuttle external tank and four-segment Solid Rocket Booster (SRB) pair, this launcher made maximum use of the space shuttle launch infrastructure. MSFC agreed, and issued an RFP to a consortium of all three contractors which focused only on the side-mount carrier. Different size cargo units were studied, as were different engines to be mounted on the base of the tank. Two and three SSME designs were analyzed. The Cargo Element postulated use of the shuttle orbiter Orbital Maneuvering System (OMS) engine pods, payload bay doors that remained attached after orbital insertion, and a nose cap derived from the orbiter. The set of SSMEs under review would all operate at 104% power levels. Such a vehicle would assemble the large elements of what was then called "Space Station Freedom", with the manned shuttle flying what would be called today outfitting and assembly flights. Shuttle avionics would be adapted for the cargo vehicles. The OMS pods and the entire "boat tail" carrying the SSMEs would separate after payload extraction and reenter the atmosphere inside a heat shield derived from the orbiter's Thermal Protection System (TPS). This unit, like the solid rocket boosters, would be recovered at sea and reused. Under terms of the consortium RFP, a full scale 'engineering development unit' was built of the Cargo Element. Interior designs were looked at which included replicating the payload longerons from the orbiter bay, as well as mounting fixtures for an Orbital Maneuvering Vehicle. But budget cuts imposed in 1989 eventually stopped taking the concept, then called Shuttle-C, to the next stage. The project was terminated in 1990. The engineering development unit, an impressive must-see exhibit on any unofficial tour of MSFC, was last seen in pieces, rotting away. 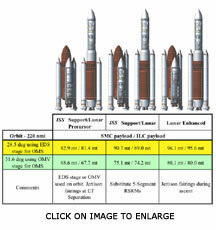 Fourteen years later, the ESMD revisited the concept of a heavy lift cargo launcher which would be made from the SRBs, External Tank, and SSMEs. As would be expected, planners began where their predecessors left off - with the Shuttle C exercise. Their goal was first to see if a new SDV could be employed to assemble a lunar fleet in low earth orbit, and then provide the upper stage lifting ability to inject the fleet towards the moon. It was a very different requirement than earlier planners had in mind for Shuttle-C: launching Space Station Freedom components. As such, ESMD's planners looked at a variety of shuttle designs, starting with a minimal vehicle whose primary use would in fact be ISS assembly first, then assembling missions to the moon. Study participants found that a new side-mount design could improve upon the earlier Shuttle-C performance. In its baseline, or demo version, the gross lift-off weight of the vehicle would be 4.5 million pounds. Gone were the shuttle-derived payload bay doors, reusable shuttle OMS pods and Reaction Control System (RCS), recoverable engine reentry vehicle, and shuttle-derived nose cap. Instead, ESMD planners used a standard payload shroud containing encapsulated payloads and an OMV. The on-orbit OMS system was expendable and simplified. This version could lift a gross weight of 73.5 metric tons to a space station orbit, a significant increase over the 1980s Shuttle-C, or about 7.6 metric tons more lift. In this new version, actual cargo launched to the ISS would be in the range of 63.6 metric tons. Unlike Shuttle-C, this variant threw everything away - except the deployable payload. 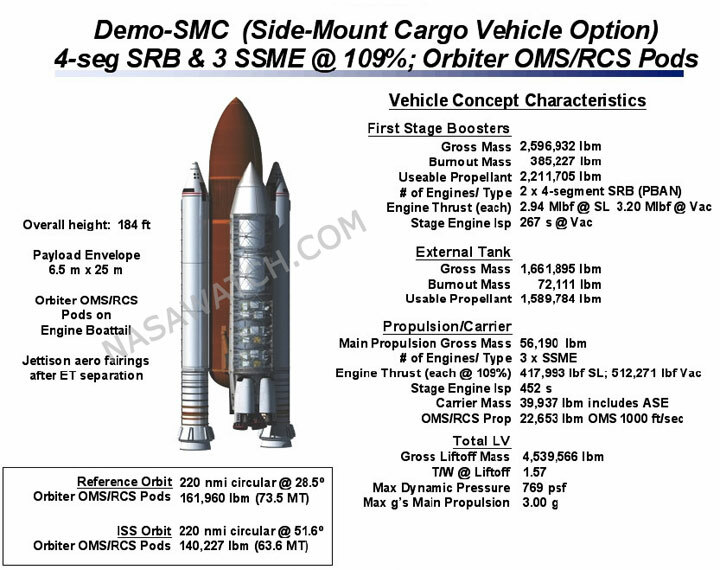 A second variant of the shuttle-derived side mount replaced the OMS pods with an Earth Departure Stage or OMV. This raised the payload capability to 78.2 metric tons. It retained the four-segment SRB from the existing shuttle fleet. 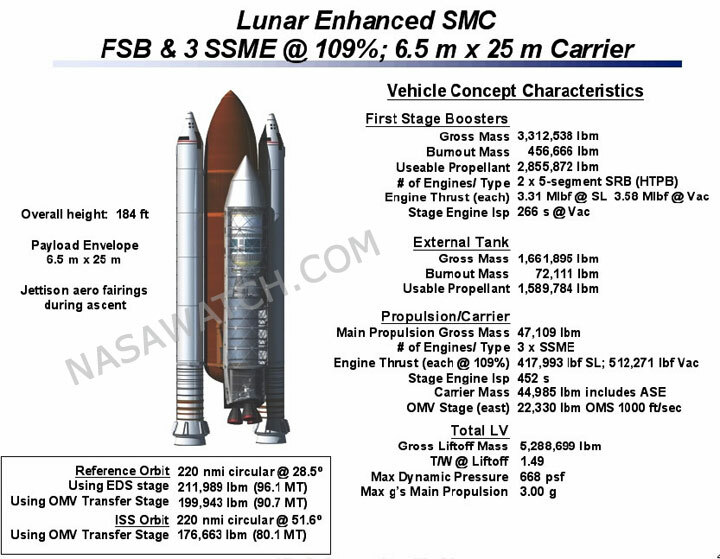 An advanced lunar variant using the five-segmented SRB, stretched ET, and an OMV could raise the payload capability even higher, to 85.5 metric tons. But the largest side-mount shuttle derived vehicle studied was the so-called "lunar enhanced". Using uprated five segment SRBs, an even larger ET, bigger Earth Departure Stage and an OMV, this beast could throw 90.7 metric tons into orbit. It used a super lightweight ET, and three SSMEs running at 109% thrust. The top of the payload fairing would be jettisoned at ET separation. Designers said that any side-mount configuration could sustain one SSME loss during ascent and still make the target orbit, if a minimum 3 SSME cluster was used. ESMD's planners then assessed an in-line stacked version of the shuttle cargo vehicle, one where upper stages and payload were aligned directly atop the first stage modified from a shuttle ET. In one trade study this variant was called the ILV, or In-Line Vehicle. ILVs 1-3 had lifting capabilities ranging from 90 to 96 metric tons in their basic versions. Those configurations included a pair of five segment SRBs, stretched EDS, and a super light weight ET itself lengthened to carry more fuel. The smallest ILV, ILV-1 could carry 90.7 metric tons to lunar missions. The biggest variant, ILV-3 used four strap-on SRBs, stretched super light weight ET and four SSMEs burning at 109% thrust or three RS-68 engines. This rocket would have a staggering GLOW(Gross Lift Off Weight) of over 9.1 million pounds and could deliver lunar base supplies as well as standard manned lunar mission support, lifting a usable 96.7 metric tons of payload to low orbit. 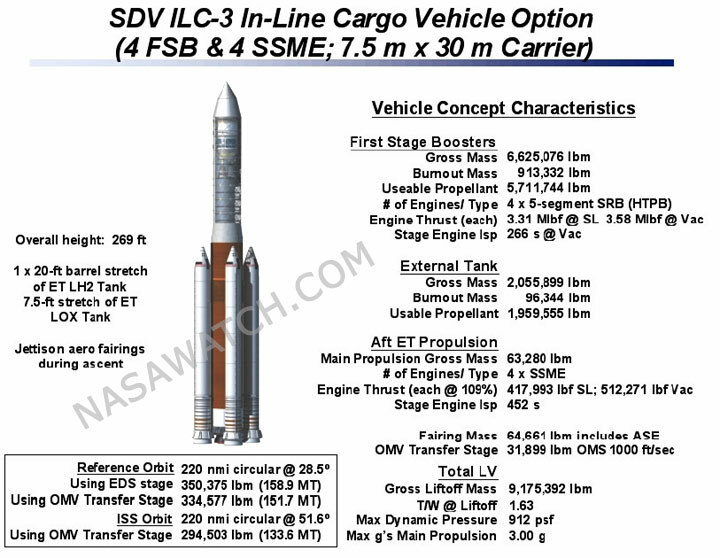 Beyond ILV-3 an in-line vehicle proposed by ATK-Thiokol used a much longer ET, SSMEs, two five segment SRBs, and a standard payload shroud and could deliver more throw-weight than ILV-3, or well in excess of 100 metric tons into orbit. Taken all together, in their smallest versions could also fly payloads to ISS using a space tug. The largest in-line vehicles had the greatest lifting and evolutionary capabilities for NASA's implementation - for although it did not get as much play, Griffin was still looking at a way to get people out to Mars. As far as heavy-duty lunar support - and Mars missions, ESMD planners found the number of growth versions of the side-mount vehicles was limited. The potential growth versions of the ILVs were much greater. ILV-3 and the ATK heavy lifter could also use a much larger payload bay shroud, 7.5 x 30 meters. In nearly every case studied, an OMV would be needed for ISS and fleet proximity operations. In present year dollars, the trade studies projected the development cost of the original Shuttle-C at $2.8 billion. It would take about 50 months to produce the first flight vehicle, the study suggested. If development were initiated now, it could be operational in 2010 to complete ISS construction. A new side-mount SDV would take an additional $3.1 billion and four to five more years past shuttle orbiter retirement in 2010. The ILV family, while the largest heavy lifters studied, would add an additional $5.6 billion to the baseline Shuttle-C development costs, take an additional 36 to 48 months, and require the most modifications to KSC facilities. Other in-line vehicles studied would cost roughly the same, but some trade analyses indicated development time could be reduced to a total 56 months from contract execution. 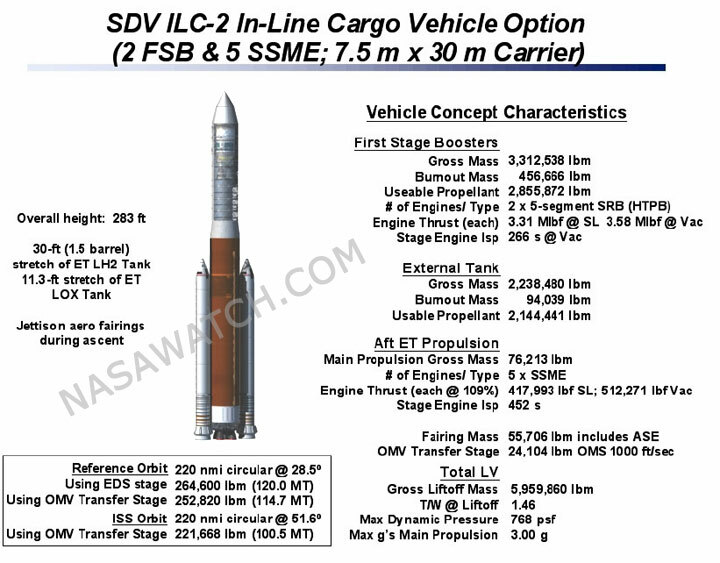 One trade study strongly suggested that any in-line SDV would be in essence an entirely new space vehicle, with similarities to the existing shuttle system in appearance only. The extensive modifications to the external tank, to carry the liquid upper stages and cargo shroud would make it very different from the tank used today. And while the SRBs were to be recoverable, the rest of the vehicle would be expendable. The preference for the bigger, but more expensive heavy lift in-line vehicle also centered on its use in manned interplanetary or Mars missions. 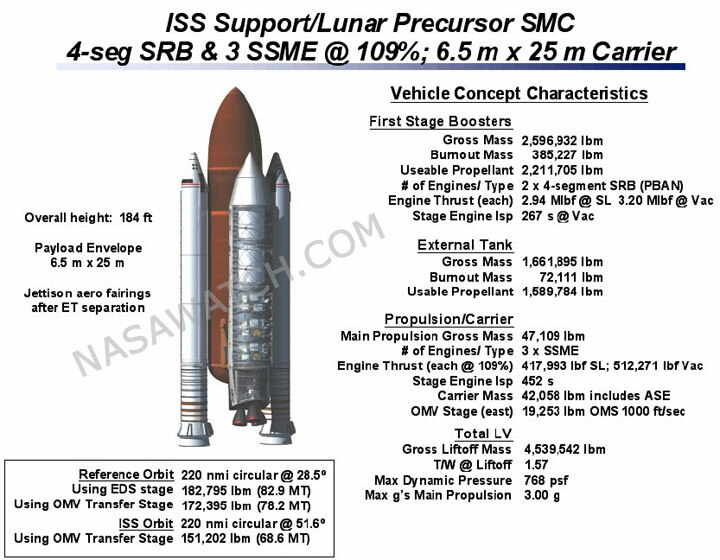 Scaled up versions using clusters of four to six SRBS and groups of RS-68 engines on the tank and SSMEs on the upper stage could produce a huge launcher capable of lifting 200 metric tons into orbit. 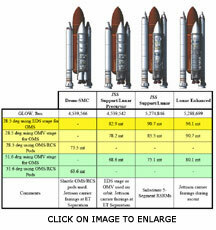 One scenario for Mars missions foresaw a much larger CEV launched by an in-line SDV, a second lifting the Mars landing vehicle, a third lifting the cruise stage, a fourth carrying the larger Earth Departure Stage, and a fifth flying up the nuclear electric Prometheus atomic rocket stage. Such a fleet could constitute the Mars expedition craft which could only be launched by a larger ILV-type shuttle derived vehicle. As this article is written, in-line SDVs appear to be carrying the day. Whatever the limitations of today's shuttle system, it has provided NASA with the means to gain extensive experience living and working in space, including building the space station. Now, in its final years, those parts of the shuttle that NASA never really wanted-the solid motors and expendable tank forming its first stage-may well out last the winged spacecraft itself. It would be ironic if the shuttle's true legacy was, in a very real sense, that its launch capabilities could be greater than the sum of its parts.